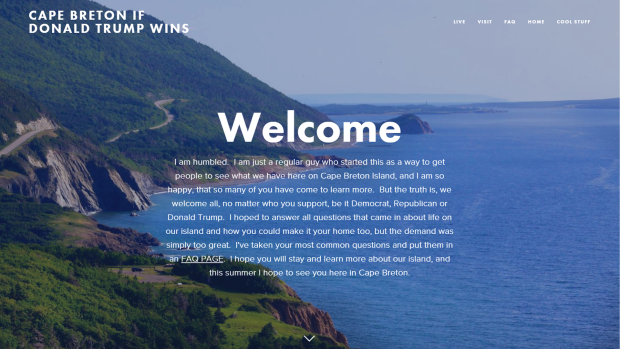 Last week, Rob Calabrese launched a website offering up Cape Breton as a refuge in the event of a Donald Trump presidential victory. This week, his tongue-in-cheek project has picked up more steam than he could have ever imagined. “I couldn't have possibly expected it to take on the life that it has,” the Sydney, N.S. native said. Calabrese said he’s had about 600,000 unique visitors to his website “Cape Breton If Donald Trump Wins” since its launch. And that boom in traffic seems to be spilling over to other parts of Nova Scotia’s digital landscape. Real estate pages that usually see around 200 hits per day have seen tens of thousands of visitors pouring in. David Johnson, a political science professor at Cape Breton University, said the fact that Trump has a realistic chance of earning the Republican nomination is in line with the current American political climate. He added that if the majority of Republicans want to select another candidate, they’d better act fast. Back in the land now being touted as a Trump-free sanctuary, it’s not difficult to find someone who disagrees with The Donald’s viewpoints. “He's got too big a mouth for one thing. I don't think he's diplomatic enough to get along with a lot of these countries,” said local resident Gary Burke. But regardless of people’s politics and how the race pans out, Calabrese said there’s a very real boost in people’s interest in Cape Breton. “A lot of people who write in have never heard of Cape Breton before. And they say, ‘Wow, it doesn’t matter who wins, I at least would like to visit,’” he said.